The Library of Congress’ Prints and Photographs Division holds the world’s largest collection of Paul Rudolph papers: their Paul Marvin Rudolph archive is comprised of hundreds-of-thousands of Rudolph drawings & documents. It is an indispensable source for anyone doing serious research on Rudolph. The Paul Rudolph Heritage Foundation has been greatly benefited by the Library’s gracious help—particularly from the head of their Prints and Photographs Division, Ms. Mari Nakahara. Our recent exhibit, Paul Rudolph: The Personal Laboratory, was meaningfully enriched by being able to utilize images from the Library of Congress’ collection—and we continue to do research there, hoping to help share this immense source of Rudolph-ian creativity and knowledge. 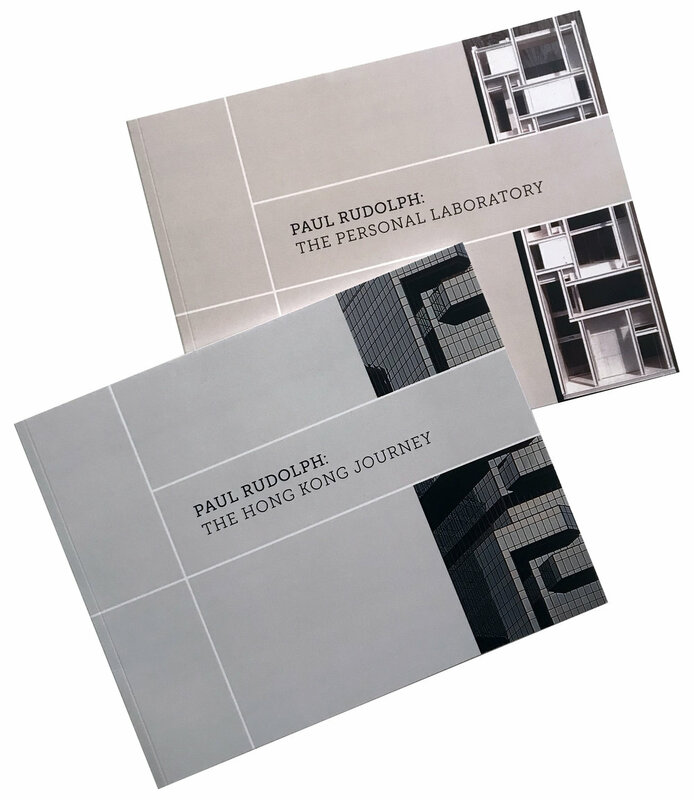 The “Personal Laboratory” and the “Hong Kong Journey” catalogs were produced in association with the two corresponding exhibits that were mounted by the Paul Rudolph Heritage Foundation. The set is available through Amazon. 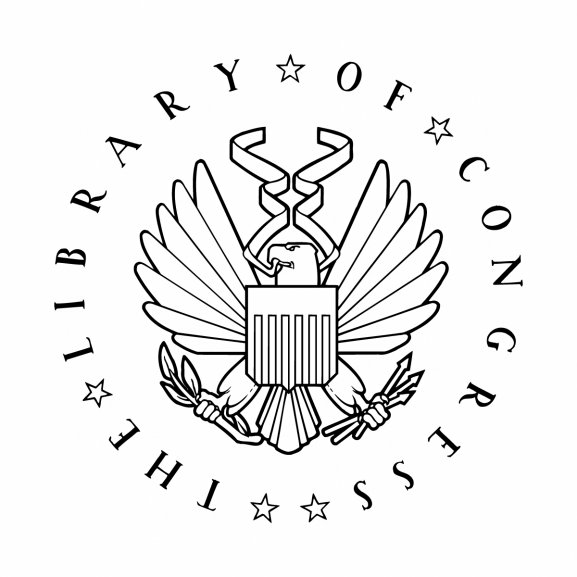 We’re happy to announce that we’ve just received an official response from the head of the Library of Congress’ Monographs Section: the catalogs have been “selected for addition” to the library’s collection. We are glad to have these publications be a part of the nation’s greatest library! This pair of catalogs was produced in association with the Paul Rudolph Heritage Foundation’s two exhibits, celebrating Rudolph’s 100th centenary year, 2018. They are available as a set—and now: easily purchased through Amazon. 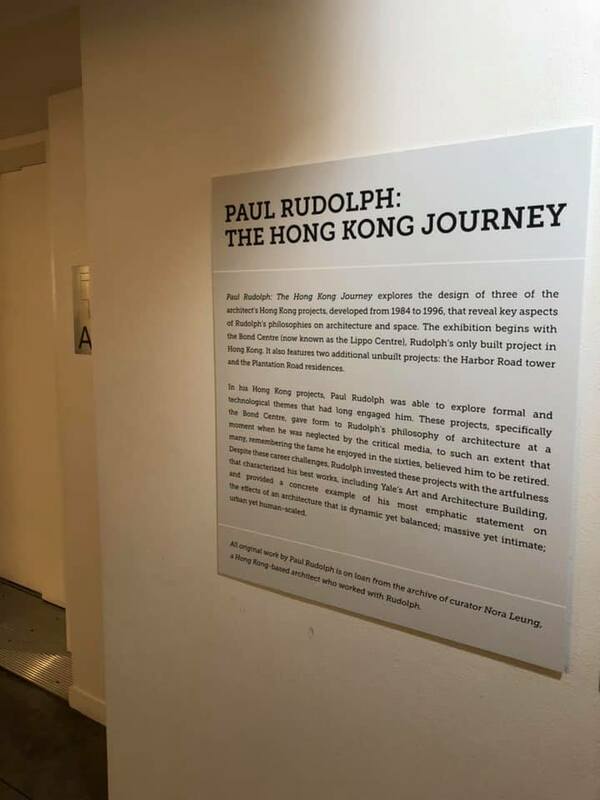 Paul Rudolph (1918-1997) would have been 100 in 2018, and—to recognize & celebrate that—the Paul Rudolph Heritage Foundation mounted two exhibits: Paul Rudolph: The Personal Laboratory and Paul Rudolph: The Hong Kong Journey. This pair of exhibits (and Rudolph’s increasing recognition) were praised in an article in The New York Times. The bad news is that both exhibits have closed—but the good news is that the pair of catalogs—well illustrated records of the exhibit, supplemented by additional fascinating material—have been published by the PRHF. “The Personal Laboratory” exhibit focused on the homes and workspaces that Rudolph crated for himself, wherever he settled. It’s catalog is richly illustrated, containing much of that material—as well as fascinating documents & memoirs of people who knew and worked for Rudolph. “The Hong Kong Journey” exhibit focused on work that Paul Rudolph did in Hong Kong. In the last decade-and-a-half of his career, Rudolph was called upon by clients in Asia: Hong Kong, Jakarta, and Singapore—and he built large and significant in that part of the world. In Hong Kong you can see the pair of remarkable skyscrapers he designed: the Bond Centre (a.k.a. the Lippo Centre). They, and several other very intriguing projects were the focus of the exhibit, which also includes interesting essays by Rudolph’s Hong Kong associate, Nora Leung; as well as an introduction by Robert de Alba. The catalogs are sold as a set—and have been available through the Paul Rudolph Heritage Foundation’s website’s “Shop” page—and continue to be. Many people prefer the ease of shopping though Amazon—and we are pleased to the catalogs available by this method too. 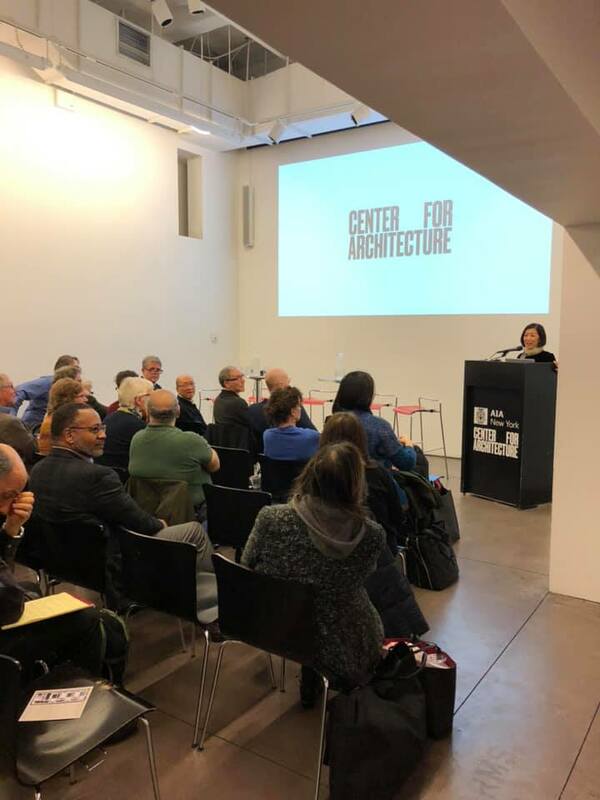 On Friday December 14 The Paul Rudolph Heritage Foundation joined the Center for Architecture for a special presentation, ‘Paul Rudolph: A Way of Working’. 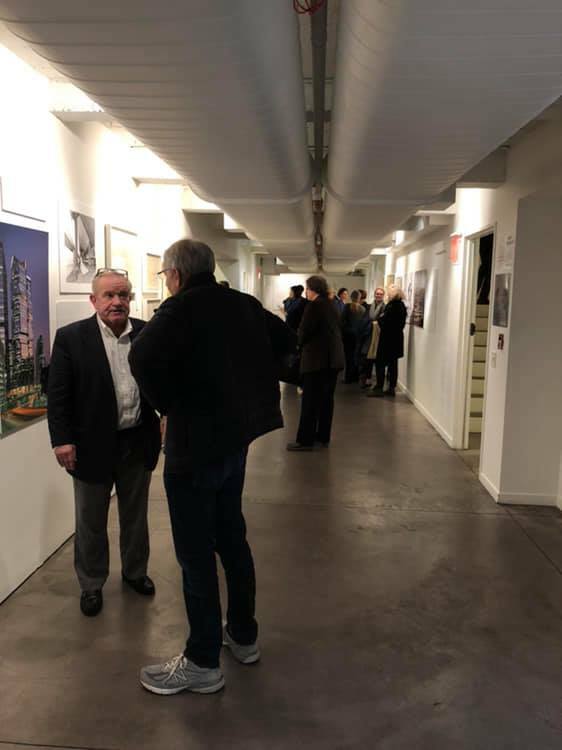 The program was presented in coordination with the exhibition ‘Paul Rudolph: The Hong Kong Years’ on display in the gallery adjacent to the event. The night began with an introduction about the Paul Rudolph Heritage Foundation by President Kelvin Dickinson. Roberto de Alba, author of the book ‘Paul Rudolph - the Late Years’, introduced keynote speaker Nora Leung who spoke about her experience working with Mr. Rudolph on several projects in Hong Kong. The program concluded with a panel discussion featuring several past employees speaking about what it was like to work with Mr. Rudolph. The event was part of the Paul Rudolph Centennial which features two exhibitions about his work. For more information about the two exhibits celebrating Mr. Rudolph’s life and work for his centennial please follow this link. for a special program for Paul Rudolph: The Hong Kong Journey. For reservations, go to the Center for Architecture’s site here. Paul Rudolph considered an allowance for growth in his architecture and once said his buildings “took on a life of their own” after they were designed. The Paul Rudolph Heritage Foundation in association with the Center for Architecture present a panel speakers influenced by the richness of Paul Rudolph’s architectural legacy. The program will present stories by those who have had the the opportunity to adapt his work to present-day needs. For more information about the event go to our website here. For speaker bios follow the link here. Paul Rudolph’s Centenary and the Paul Rudolph Heritage Foundation’s exhibitions ‘Paul Rudolph: The Personal Laboratory’ and ‘Paul Rudolph: The Hong Kong Journey’ are covered in an online article in Metropolis by A.J.P. Artemel. There was a time when Paul Rudolph was the most famous architect, if not in the world, then at least in the United States. As the leading emissary of “heroic” Modernism, he was responsible for some of the most innovative and audacious concrete buildings of the 1960s. Current stars Richard Rogers and Norman Foster went to Yale to learn from him. But after the devastating, epoch-ending fire at Rudolph’s Art and Architecture Building at Yale and multiple broadsides penned by Postmodern critics, Rudolph’s stream of projects, as well as his American following, seemed to evaporate overnight. Though much of Rudolph’s work from his early period in Sarasota, Florida, and from the height of his career in the ’60s has been rehabilitated and rediscovered by new audiences, his later work—roughly defined, those buildings completed between 1970 and his death in 1997—remains relatively unknown. Two exhibitions organized by the Paul Rudolph Heritage Foundation to mark the architect’s centenary aim to address this blind spot. It is indeed an exciting time to examine this material, not only in light of the anniversary but because of what this collection of buildings and designs may come to illustrate: a daring and often lonely effort to continue the Modernist project. For more information about the current exhibition ‘Paul Rudolph: The Personal Laboratory’ at the Modulightor building, and the upcoming ‘Paul Rudolph: The Hong Kong Journey’ go to the Centennial page here.